If you were to ask my kids what they want to be when they grow up, Big Sister E would answer immediately and decisively that she is going to be a teacher. She came to that conclusion a few years ago and has never wavered from it. Most recently she has added being a doctor to her collection of future professions and, as with every other career she has ever mentioned, I've told her that I'll support her no matter what she decides (even if I do happen to be secretly rooting for doctor over rock star). When it comes to those aspirations that all children have, Gerber Life Insurance has found a way to not only celebrate the dreams, but to help make them a reality: the Gerber Life Bring Dreams to Life Video Contest and its $10,000 Gerber Life College Plan grand prize. 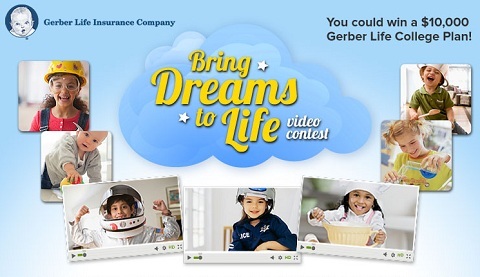 Running now through April 1, 2013, the Gerber Life Bring Dreams to Life Video Contest gives parents the perfect opportunity to show off their child's ambitions... while also earning them the chance to win a $10,000 Gerber Life College Plan! Step 1 - Take a video of your child (who must be 8 years or younger) telling what he or she dreams of being when they grow up. If your child is too young or can't talk, feel free to add your own thoughts and be creative. Step 2 - Log onto the Gerber Life Facebook page and submit your video to the Bring Dreams to Life Contest. Step 3 - Share your child's video with friends and family on Facebook and urge them to vote. Videos with 100 or more votes will automatically qualify for the final round. Step 4 - A panel of judges will select the grand prize winner and 10 runners-up from among the finalists. The grand prize winner will be awarded an amazing $10,000 Gerber Life College Plan and the 10 runners-up will receive a $100 gift card. All that's left to do is find out what endeavors your child has for their future career. Firefighter? Musician? Police officer? Librarian? Lawyer? 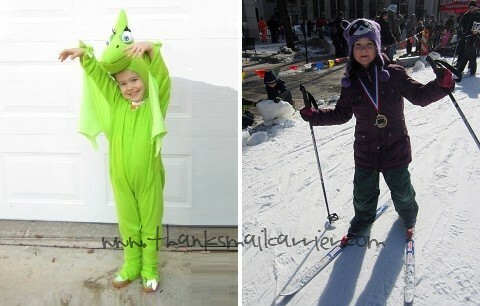 Pteranodon and cross country skier, perhaps? No matter what path your child yearns to follow in life, now is the perfect time to get it on video and help make their dreams come true! Find out more details and rules for the Gerber Life Bring Dreams to Life Video Contest on Facebook today. 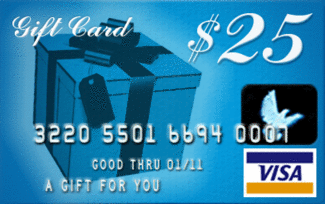 One lucky person will win (1) $25 Visa Gift Card and (1) Gerber Life Calculator and Pen! A big thank you to Gerber Life for providing a gift card for me as well as a gift card, calculator and pen for one lucky giveaway winner. The opinions shared are my own and honest and if you really need to see more, click here to see how I roll. No children, but I wanted to be a doctor. My grandson turns 9 on the 17 of March and right now he either wants to be a police officer or firefighter. My daughter says she wants to be a doctor or an an artists. Since I'm a starving artist I am SO pulling for doctor! LOL When I was little I wanted to be an artist and that's what I wound up doing. When I was a kid I wanted to be a journalist. My daughter wants to be a vet. When my son was little, he wanted to be a taxi driver, I was really happy that he outgrew that choice. Broadcaster. So glad I'm not one! my nephew wants to be a police man. I thought being a pro soccer star would be fun. I wanted to be a US Navy Marine Biologist until about high school. Right now my three year old just wants to be a Princess. My son WANTED to be a pilot but has since changed his mind and wants to go into some form of engineering, maybe bio medical. My son currently wants to be a Spaceship... I hope he alters that idea soon! I wanted to be a teacher when I grew up, and that's what I became! He wants to be a zookeeper! My son wants to play in the NHL and my daughter wants to be a teacher. My daughter wants to be "an ice cream lady." My daughter wants to be a nurse. My grandson wants to be a race car driver. My daughter wants to be a ballerina. One of my sons want to be a Policeman and the other a builder/engineer. I wanted to be an author when I was younger. My childhood dream profession was a baseball player. Growing up I always wanted to be a lawyer. my 5 year old son says "i want to be funny and people give me toys for it"... i explained what a comedian is and he was SO relieved :). I always wanted to be a nurse but didn't go in that direction. He wants to work in anime. my daughter wanted to be a WWE wrestler, lol! what your childhood dream profession was. My Granddaughter wants to be a Nurse. My son wants to be an engineer. My son says he wants to be a doctor. I always wanted to be a lawyer when I was young. But after taking a few classes in college, the I realized that's not what I wanted to do. My son wants to be an astronaut! I wanted to be a Marine Biologist. When I was a child, I wanted to be an actress. I wanted to be a vet! I wanted to be a stewardess (1950s). I did volunteer for the Civil Air Patrol and got to fly with them. My little guys both want to be soldiers. My goddaughter wants to be the President. My son wants to be an astronaut or a pirate this week. Thanks so much for the fantastic giveaway! My 13yr old: mma fighter and oral surgan, 12yr old: make monster props and movies, 9yr old: marine biologist and find mermaids and my 4yr old wants to be a veterinarian. haha The kids here are still young enough to want to be "a princess" when they grow up! No children yet. I wanted to be a professional dancer on Broadway. I always wanted to be a teacher as a kid! My son says he wants to be a builder like his Daddy! My son wants to be a surgeon or a video game tester. My son want to be an astronaut! My son would like to be a major league pitcher. My son wants to be an architect. I wanted to be a dog team driver. I wanted to be a tap dancer! In my early early years I wanted to be a teacher or a nurse, then I decided I wanted to be a marine biologist to play with dolphins as we were told in our college orientation sessions. That path never panned out & switched to a more health oriented degree. I wanted to be a celebrity hair stylist. My son wants to be a firefighter. he wants to drive a big truck! Oddly enough, I wanted to be a chemistry teacher, like Bill Nye. My daughter wants to be Batman! Tristan wants to be a racecar driver. I really wanted to be a pilot until I learned how much I hate all science classes! My daughter wants to be a doggie doctor (vet). I wanted to be a teacher! my daughter wants to be a writer most of all. my little cousin wants to be a singer!!! My daughter wants to be a dentist. My son wants to be a video game designer and my daughter wants to be a teacher. Thanks for the chance to win! I wanted to be a farmer! LOL Everything thought it was so funny. Now, I'm not a farmer, but I absolutely love gardening! Close enough for me! I wanted to be a zookeeper. My son wants to be a postman/artist! My daughter wants to be a vet. Growing up I always wanted to be a mommy that stayed home and took care of her kids. Year after year teachers were telling me that's not a job. Totally living my dream and with three kids, there's plenty of work! My son has always wanted to be an animal cop and work for the ASPCA. I wanted to be a dancer! I have a large family. I just tell about one of my daughters. She wants to be a dress designer. Granddaughter is too young - but I wanted to be a nurse. My son wants to grow up to be a doctor. My daughter wants to be a vet and my son wants to be a police man! I wanted to be a teacher. I should have so I could have summers off. He wants to be a superhero. I wanted to be a vet when I was younger. My daughter says she wants to be a preschool teacher. My daughter wants to be a teacher. My childhood dream was to be a nurse. I wanted to be a lawyer! My oldest daughter wants to be a nurse or a veterinarian or a nurse(8). My youngest daughter wants to be a female astronaut(4). Rylie and I actually just had this conversation this morning. She said she wants to be a doctor. I always wanted to be a lawyer like my father. My son wants to be a police officer! All I really wanted to be when I was little was a mom! My childhood dream profession was being an architect. I wanted to be a band teacher. My nieces want to be a teacher & a nurse. I wanted to be a mail carrier. And it came true!